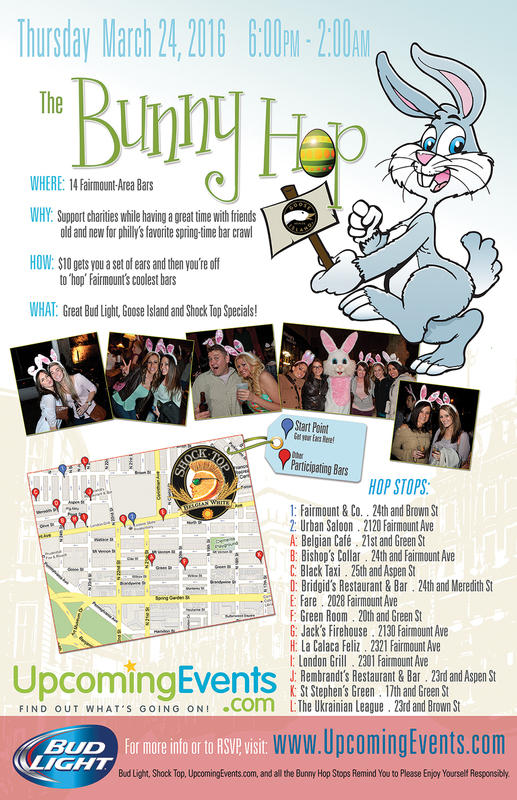 18th Annual Fairmount Bunny Hop is here! Participate in the area's favorite spring-time bar crawl with great drink specials and over 2,000 people! Can't come right at 6:00pm? No problem. Come when you can - we will be going all night long!!!! Sponsored by Shock Top & Bud Light. Get Your Ears at: Fairmount & Co. (formerlly Brown Street Pub) (24th and Brown) or Urban Saloon (2120 Fairmount). Hop on Your Own to: Belgian Cafe (21st & Green), Bishop's Collar (24th & Fairmount), Bridgid's (24th & Aspen), Fare (2028 Fairmount Ave), The Green Room (20th & Green St), Jack's Firehouse (2130 Fairmount), La Calaca Feliz (2321 Fairmount), London Grill (23rd & Fairmount), Rembrandt's (23rd & Aspen), St. Stephen's Green (17th & Green), and The Ukrainian League (23rd & Brown).